With fall already here, Bob and I decided to take a drive out east on Long Island before the caravans of apple and pumpkin pickers crowd the roads. What started as a simple day trip, ended up as a tablescape. If you live on Long Island, NY you are quite familiar with the term “out east”. If you aren’t familiar with Long Island, sit back, I’ll explain…. Any town east of the town of Riverhead on Long Island is considered the East End of Long Island or “out east”. The east end is made up of the North Fork and the South Fork. (still with me?) If you imagine that Long Island is shaped like a fish the North and South forks are the tail. Each fork is famous for different things; the north fork is the vast majority of LI wineries, farms, orchards and shopping. This is the place to go when you want a peaceful drive out to the country or a day of farm stands and wine tasting. The south fork is famous for the Hamptons, Montauk Point, shops, restaurants, small villages and of course celebrity spotting. Montauk Point is THE END of Long Island (another term for a later date, I don’t want to confuse you) and is famous for not only the Montauk Point Lighthouse but fishing and surfing. I hope I didn’t lose anyone. Bob and I frequently take a drive “out east” on the North Fork to visit a winery or a farm stand or just to try a new restaurant. Recently, during our drive we passed by a garage sale and Bob’s eyes lit up. Yes, my husband loves garage sales because he collects old radios. He started his collection back in the day with his grandfather and I think it keeps grandpa close to his heart and those childhood memories alive. I just knew we were going to stop. 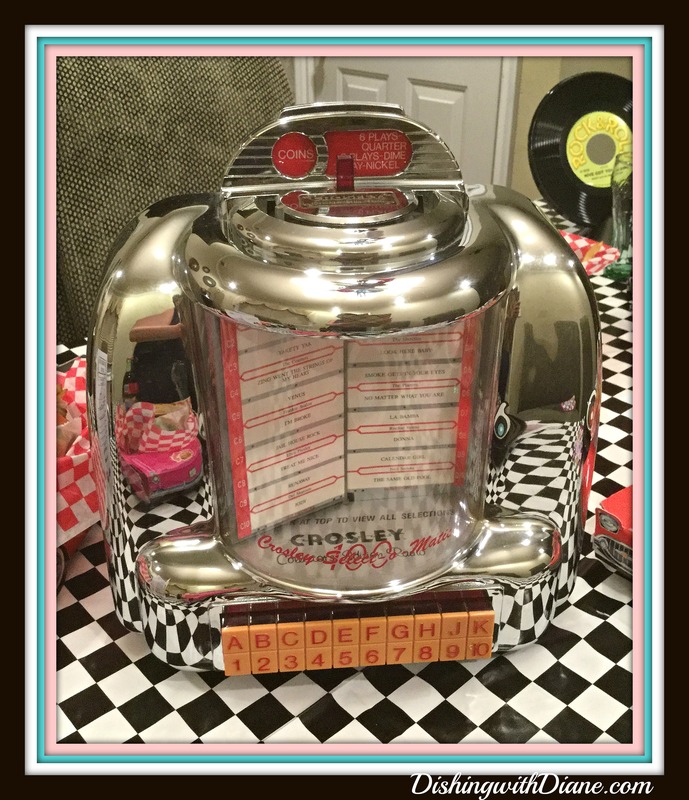 Bob spotted an old juke box radio that looked like it popped out of a 1950’s soda shop. I immediately knew we would own this new treasure. Bob saw an addition to his collection and after careful inspection, I saw a centerpiece. And that is how this tablescape was born. 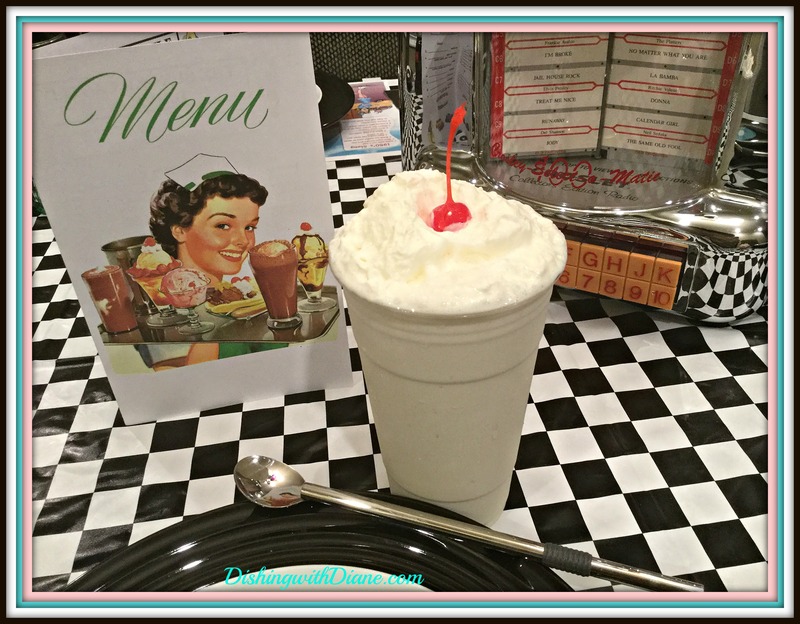 My mind started racing about all the things that an old fashioned soda shop would have. 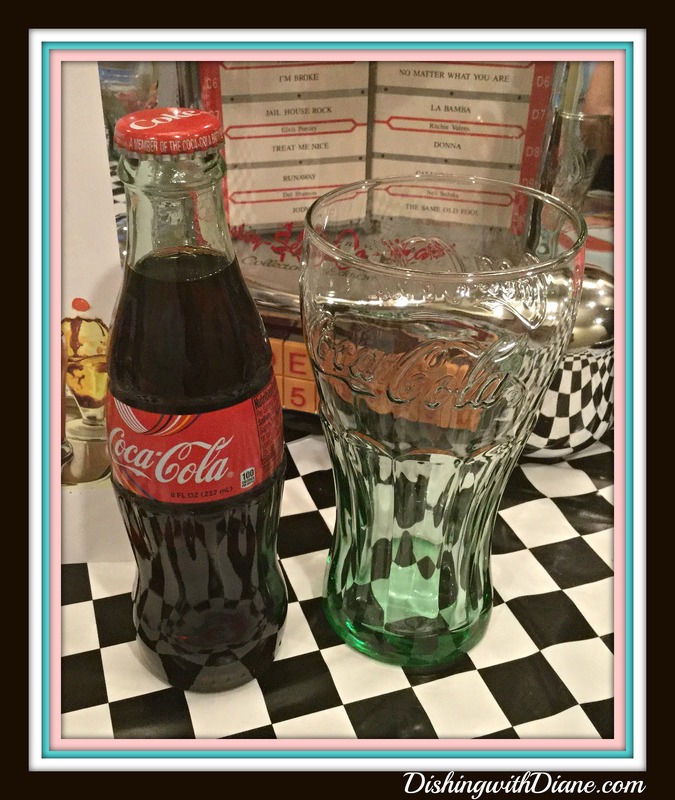 Coca Cola glasses – I have them, banana split dishes -I have them, ice cream soda straws – I have them. Yup, this could be interesting. The one thing I didn’t have was a tablecloth for this theme. This required a little shopping. 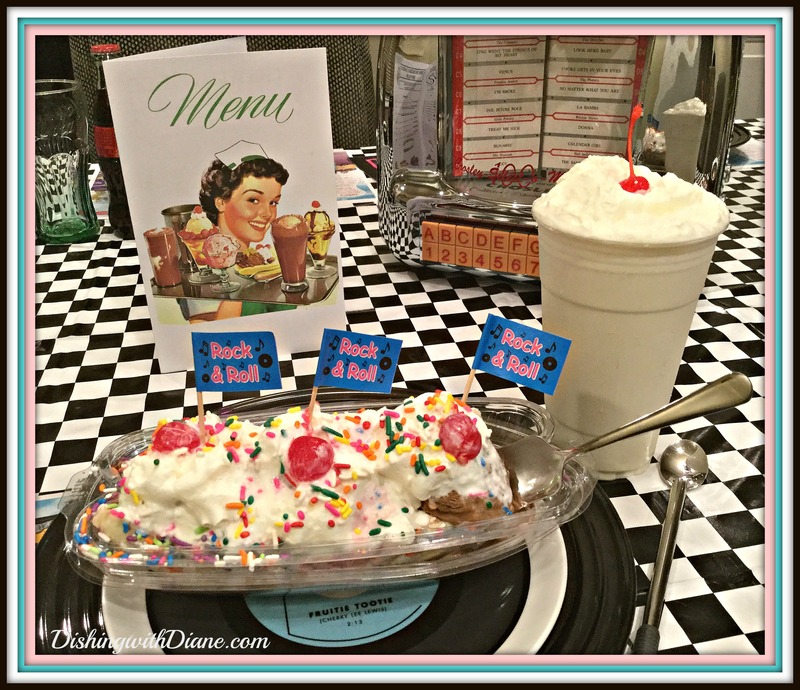 All of the 1950’s decorations I have ever seen always focuses on the colors, pink, turquoise and black & white check. Well, I searched online, (including Amazon) and no check tablecloth that I liked, so I was off to Party City. 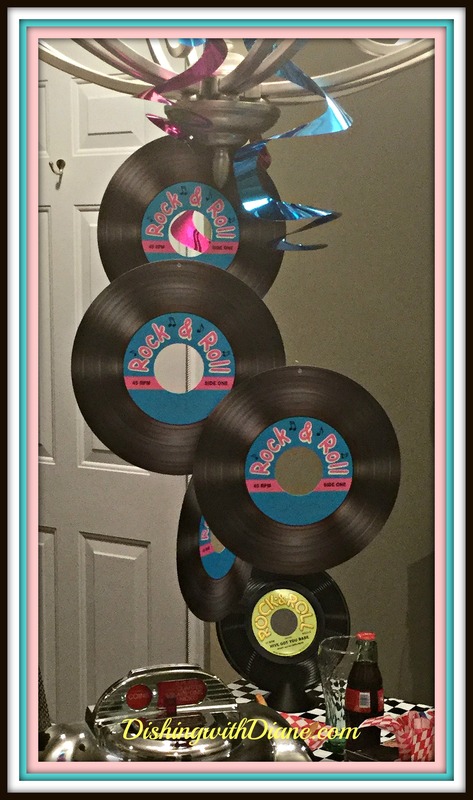 I purchased a vinyl tablecloth along with some 50’s theme napkins and danglers for the chandelier. 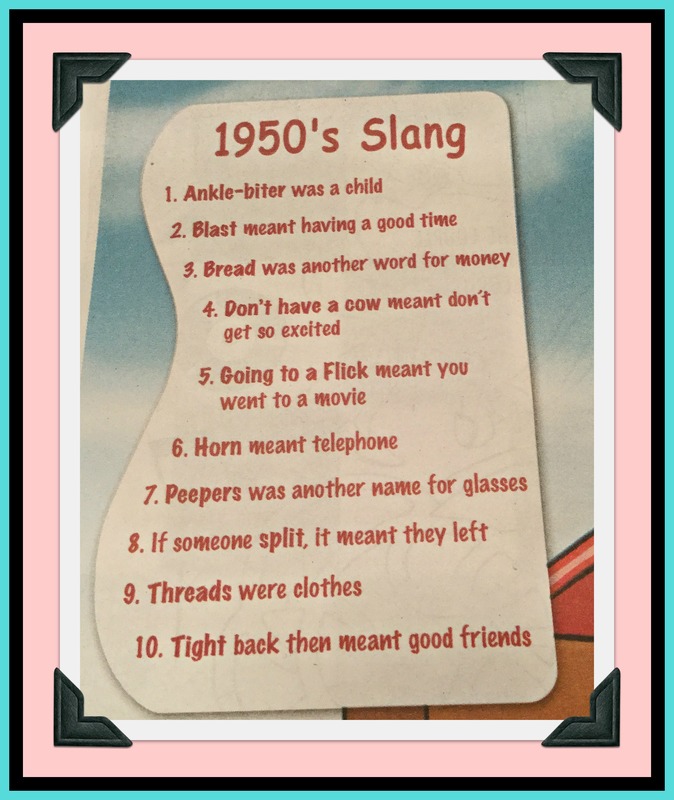 I found paper placemats that listed “1950’s slang”. For example “bread” meant money, “horn” meant telephone and “threads” were clothes. So I added the placemats to the table for a little fun. I am using black dinner plates with a circular design on the rim that reminded me of the look of the old 33 RPM records (I know I am showing my age). 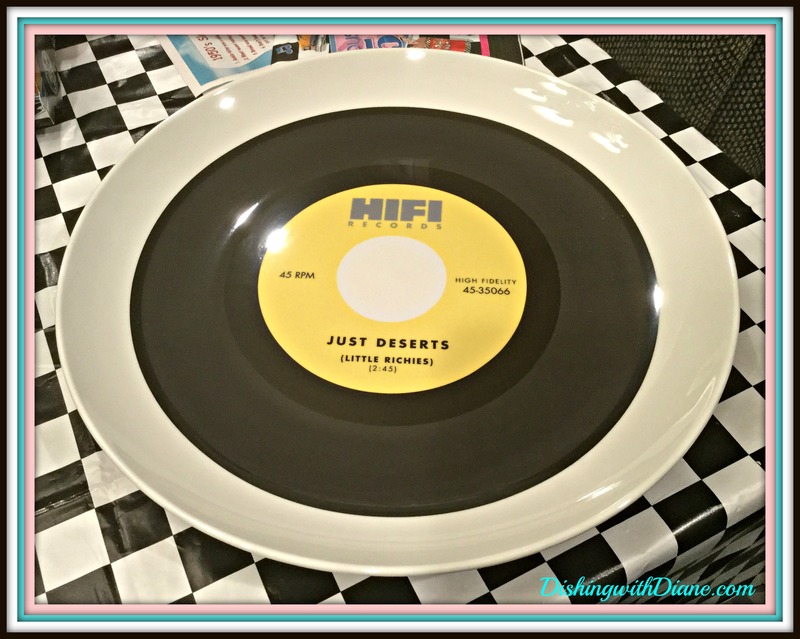 Many years ago I bought porcelain salad plates that look like 45 RPM records which I never had the chance to use, so I added these dishes to my place setting to keep the record theme going. 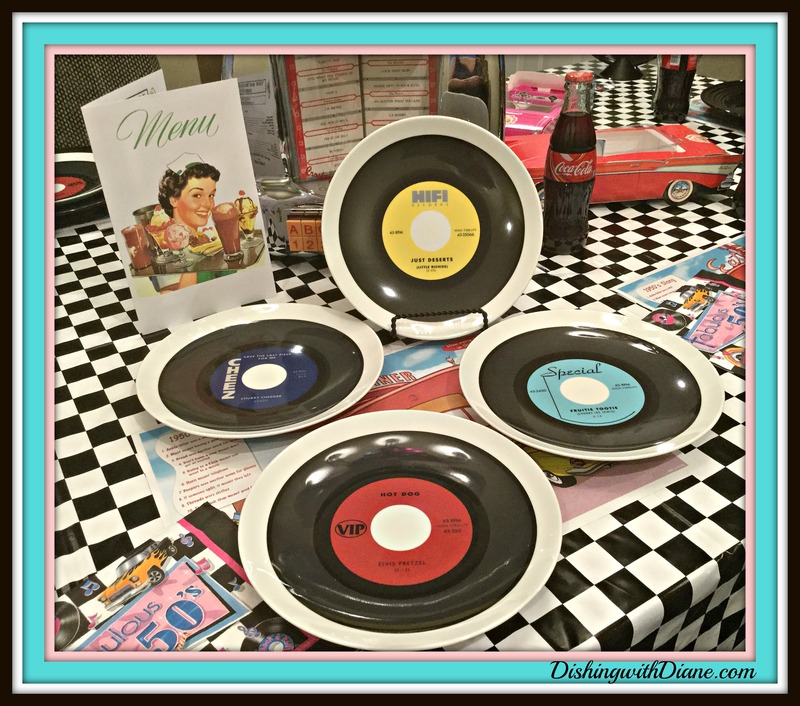 Along with the salad plates, I had two “record” platters that matched the salad plates. The table was starting to come together. No flatware, just finger food. 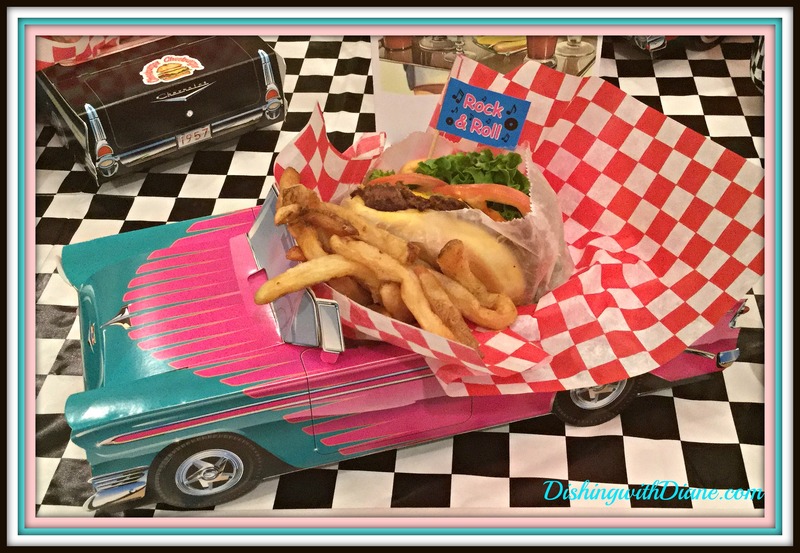 We recently went to a hamburger restaurant, called Cheeburger, Cheeburger after a long afternoon of shopping and they were serving the kids meals in cardboard replicas of 1950’s cars. I had an “aha moment”, so I asked the waitress if I could buy a few and they were kind enough to sell them to me. Here is a sample of the designs. 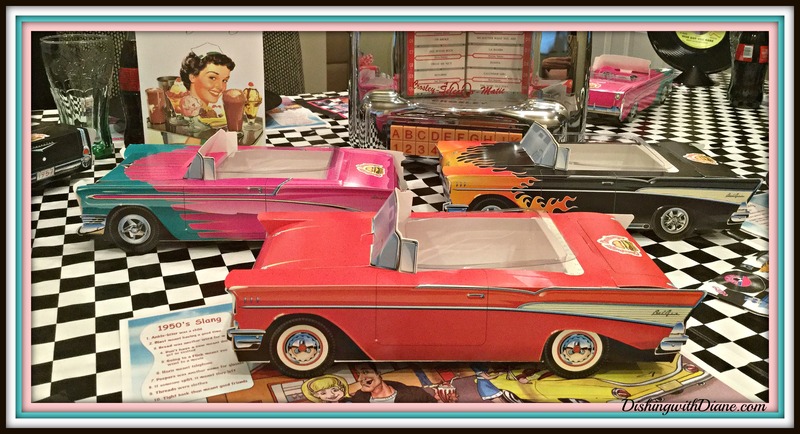 I’ll have to use these on my table to serve the ultimate soda shop lunch; a hamburger and fries. (Plus a bottle of coke for the coke glasses). 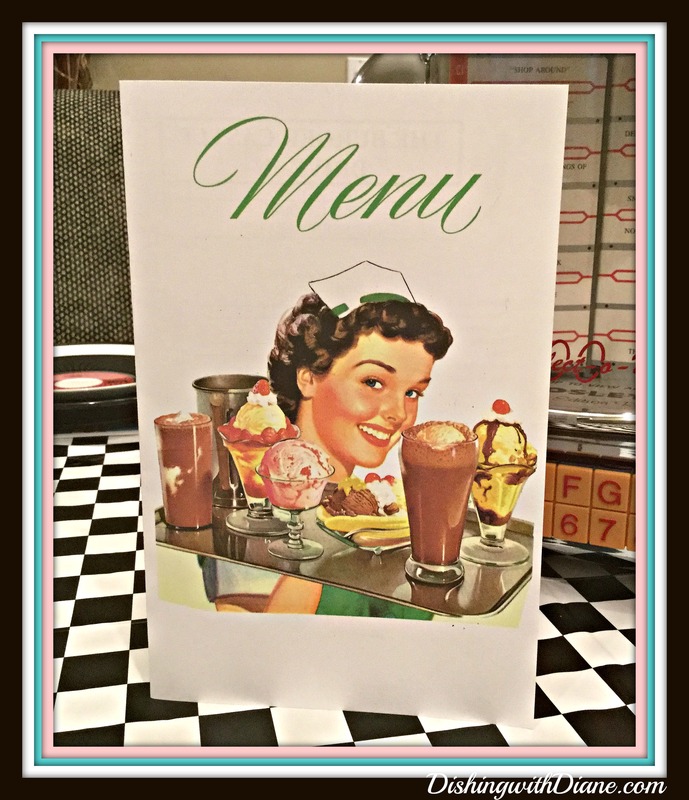 Still digging in my buried treasure, I found some 1950’s toothpicks, a plastic record centerpiece and a 1950’s menu. I completely forgot I bought this menu. 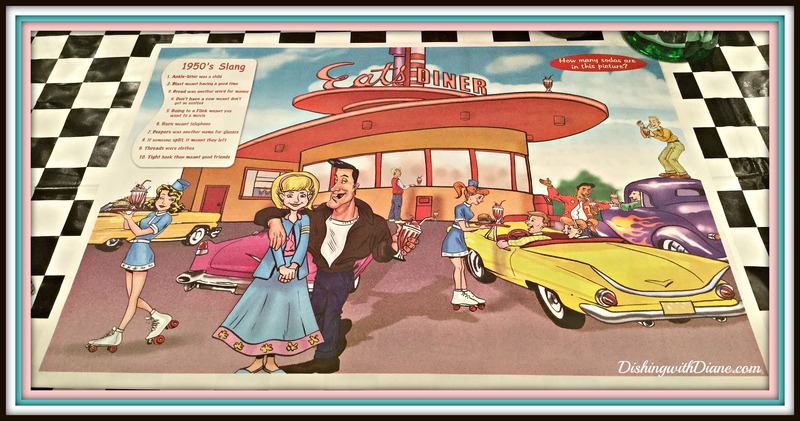 It has all the 1950’s prices listed inside and just so much fun to read. And now for the star of the tablescape and where this all started. 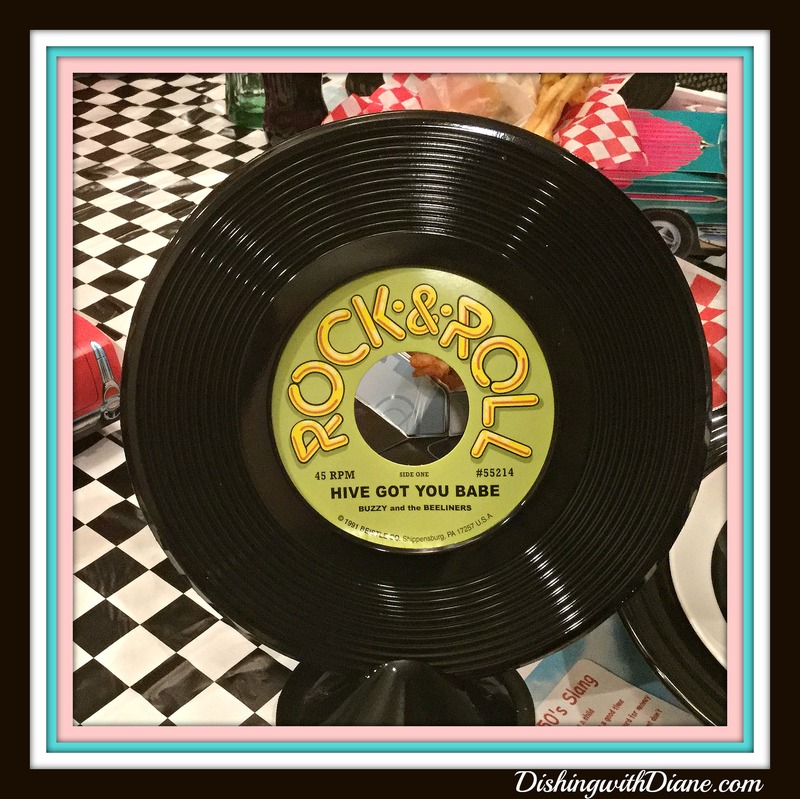 My centerpiece, the juke box radio or Bob’s new treasure as we like to call it. 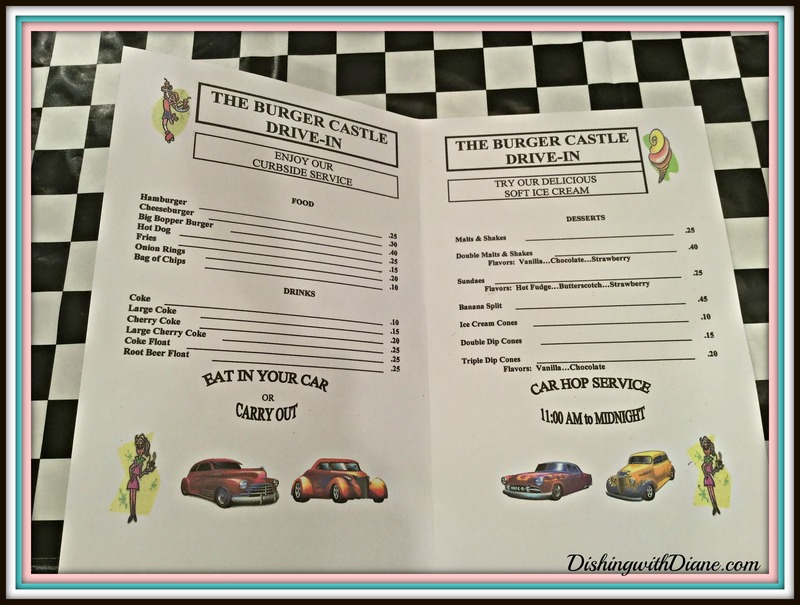 As I previously mentioned, the menu for this tablescape can be none other than a hamburger and fries, and if you don’t want the soda, you have to have a shake. I hope you enjoyed this tablescape. I had a lot of fun with it and remember, anything can become a centerpiece for your tablescape. Think outside the box. 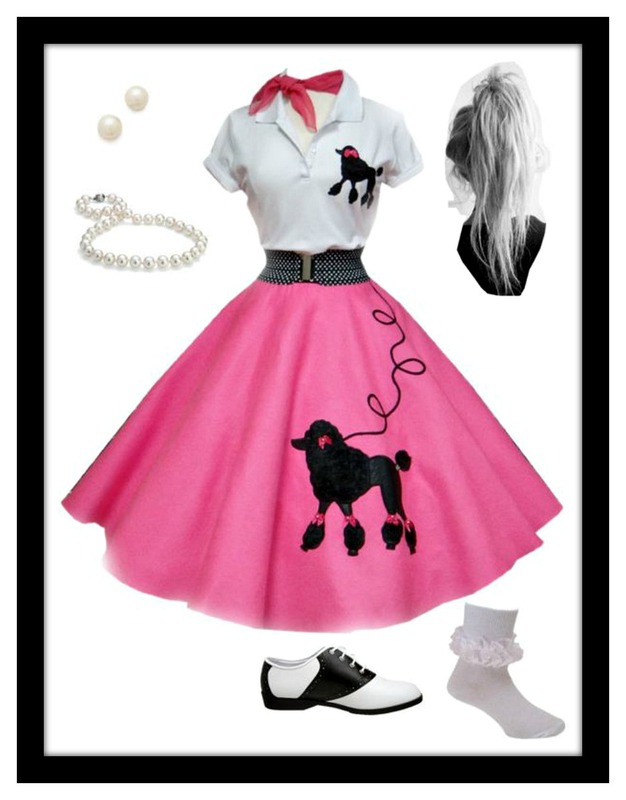 All I need is to wear a poodle skirt, pony tail, bobby socks and saddle shoes and I am all set. (Back to showing my age). This entry was posted in All Occasion Tablescapes on October 9, 2016 by aries041158. Just lovely as usual Diane. You are amazing. just wondering where do you store all this magnificent plates and and all the glasses and everything. I barely have room for my things.? I have everything organized in boxes in the basement – all numbered and I have an excel spread sheet on my computer with all the box numbers and it’s contents. Always love looking at your creations..they are fabulous. You are very creative and a great cook also. So talented. Chris, thank you so much. You just made my day with your compliments. I am so glad that you enjoy both the tablescapes and the recipes as well. Thank you for following the blog. Diane, I love your latest tablescape! I bet your friends really look forward to an invite from you and enjoy your passion . . . . Such FUN!! Eleanor, let’s just say that my friends are truly, “the ladies who lunch”. If you are ever in town, let me know and I can whip up a tablescape and lunch for you. I would love to have you. Thanks, Diane, I have my next party idea! 🎲🍟🍧 Love your ideas and so will my company. 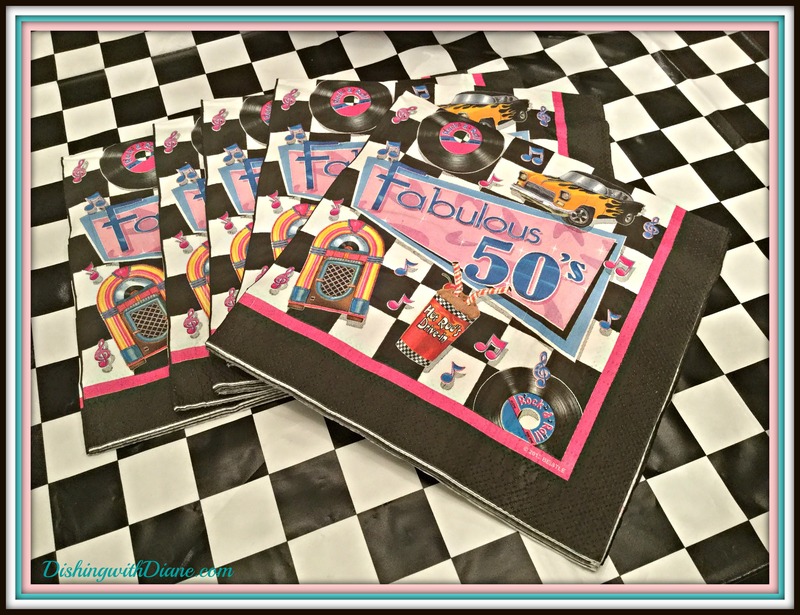 I will have to start gathering lots of 50’s items so probably it will be a Spring party. 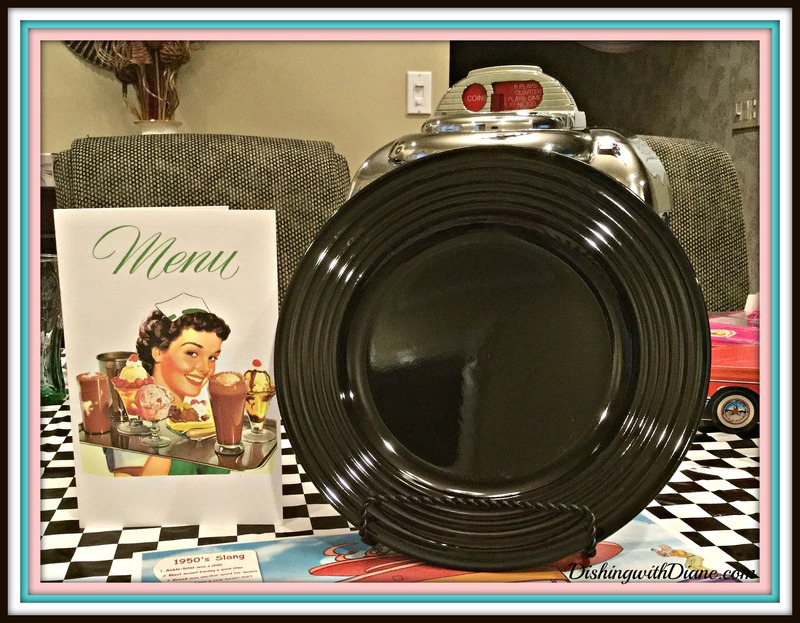 Hi Nancy, I am so glad that you are enjoying the blog and it is helping you plan your parties. If we lived closer, I would just prepare the tablescape for you. Any questions for the tablescape, I am here to help. Thank you Janet, so glad you like this tablescape. Thanks for your comment. 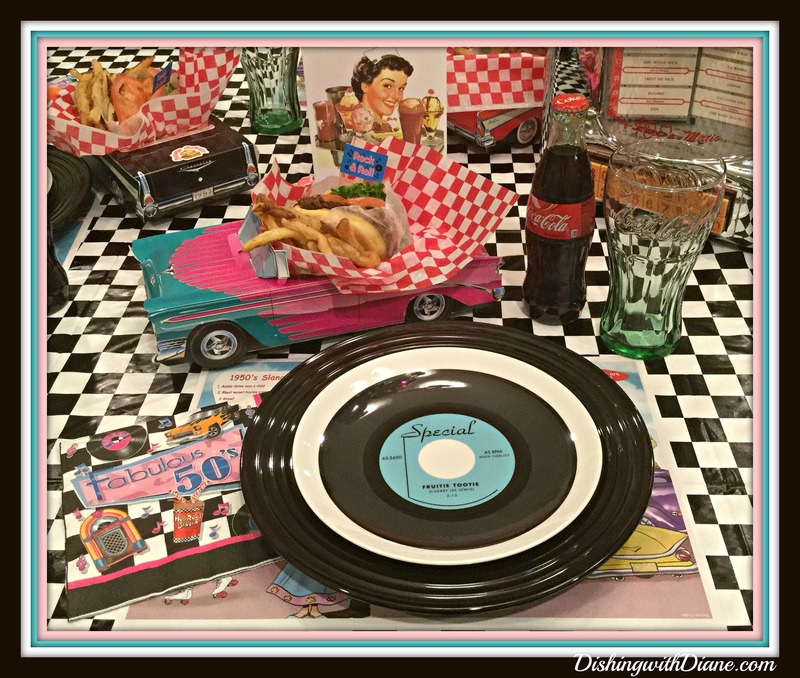 This was the most fun tablescape and brought so many wonderful memories back to me! A definite winner, Diane!! Thank you Suzanne, I am glad you liked it. I had a lot of fun with this table. Thanks Jeanne, I never know when I’ll see something that becomes a tablescape. Having a lot of fun with the blog. Wow — I love every detail! So much fun!! Thank you Lauri. I am so glad you liked the tablescape. I really did have a lot of fun with this one. Are you a member? Don’t forget to join so you never miss a post or a recipe. 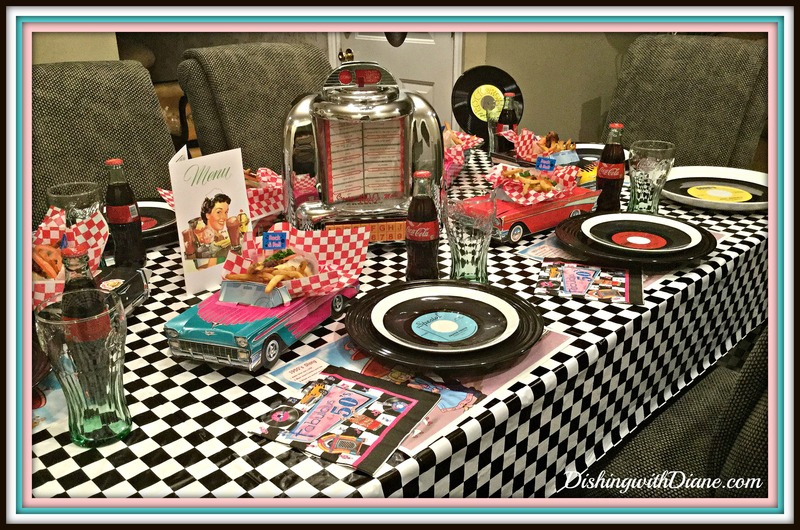 What a fantastic tablescape! And I am sure you had as much creating it as the finished product was for your guests! Wonderful idea and thanks for the geography lesson too! 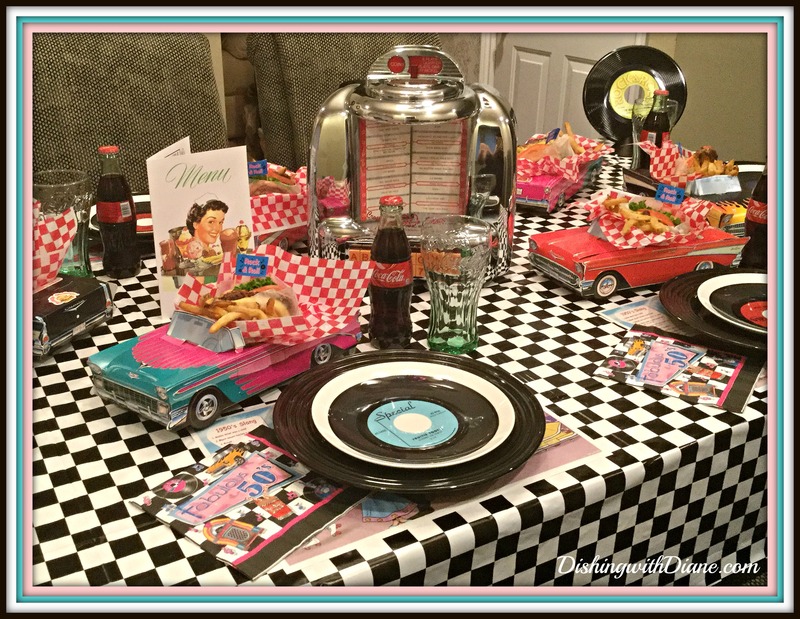 Thank you Darlene, Yes, I had a lot of fun with this tablescape. Bob didn’t know at first that his new treasure was going to be my centerpiece, but it worked out well. Glad you liked the geography lesson too. You never know when it can come in handy. Are you a member? If not, please join so you don’t miss any future posts and thanks again for your comment. Stay well. What a fantastic idea! Love everything! You are very talented Diane, right down to the tiniest detail! 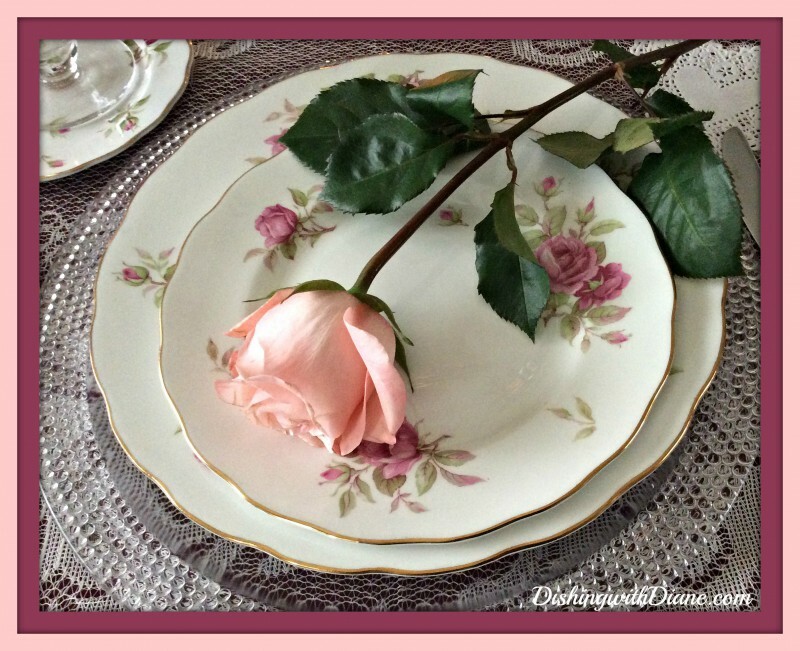 Keep these tablescapes coming! Thank you. I am so glad that you liked the latest tablescape. I am having a lot of fun with the blog, more to come. Wow – you have certainly paid attention to every detail with perfection! 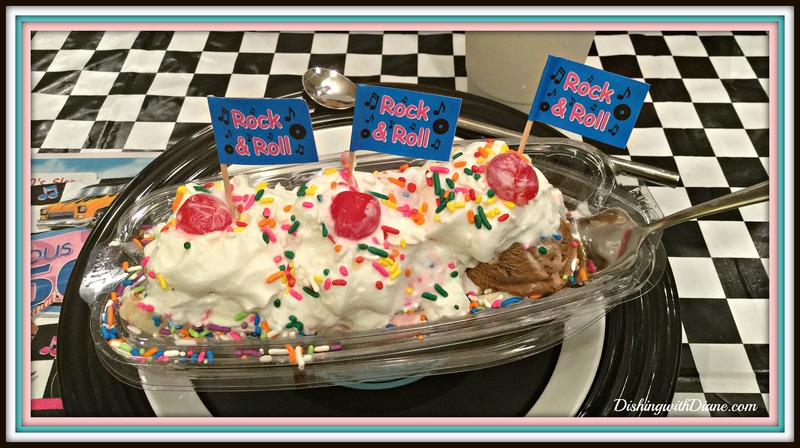 This brought back some great memories for me, and especially “saddle shoes”! This post was a lot of fun and I hope to make it “out east” some day!